It was the idea of Elizabeth Wardle to make the replica Bayeux Tapestry. She was a skilled embroiderer and a member of the Leek Embroidery Society in Staffordshire. Her husband, Thomas Wardle, was a leading silk industrialist whose business was manufacturing and dyeing threads. The couple were cousins and lived in Leek, Staffordshire, were wed in 1857 and their affectionate marriage had yielded fourteen children. The family business was fabric dyeing at the Hencroft Dye Works. Thomas specialised in silk threads and travelled extensively in India to buy silks and perfect its dyeing. Thomas also pioneered needlework kits, which proved popular with Victorian women when needle-art was once more appreciated among the leisured class. Although the business had embraced the new aniline dyes introduced from the 1850's, Thomas maintained his interest in dyes derived from natural plants. William Morris approached Thomas in 1875 for help with natural dyeing. Thomas's younger brother George worked at Morris & Co in London, which produced the iconic designs of what we now call ‘the arts and craft movement’. One of the dyeing sheds at Hencroft was used for two years of experiments and production. It might have been Elizabeth’s contact with Morris that helped inspire her to organise the making of a copy. A few years after the association of Thomas’ company with Morris had begun we find, by 1879, Elizabeth organising the Leek Embroidery School where the firm’s embroidery kits were probably developed. The works records show that 100 pounds of wool was required and the dyestuffs used included madder, woad, walnut roots and weld. The wool was overdyed to produce the shades and colours required. Elizabeth researched the Bayeux Tapestry by visiting Bayeux in 1885. Prior to that she had visited The Society of Antiquarians who had a set of hand-coloured photographs of the tapestry which were held by the South Kensington Museum, now known as the Victoria & Albert Museum. 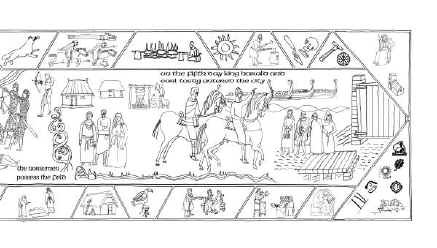 It would be fair to say that the full value of the original tapestry had not been appreciated by the French and it was various English experts who were beginning to unravel the many mysteries that surround the images, origin and very survival of the Bayeux Tapestry. Thirty-five women worked the panels and there was a team of tracers and a team of two who joined the panels, all working under Elizabeth Wardle's direction. The stated aim of the project was to make an accurate replica of the Bayeux Tapestry "so that England should have a copy of its own". But it was also a business venture, although the dividend it paid certainly fell short of Elizabeth’s expectations. Most of the women worked alone but a few worked together. We know this from the signature that they added at the end of each panel. Anne Smith Endon produced the most work as measured by length, with nearly twenty feet of the embroidery bearing her signature. E. Eaton on the other hand completed just six inches. It was probably started early in 1885. The replica panels were placed on display in the Nicholson Institute, Leek, by 14 June 1886. This also offers an insight into how long the original may have taken to complete. If, as Jan Messent suggests, the Bayeux Tapestry was the work of six or seven English convents, most within ten or fifteen miles of the next, the conditions under which it was created were not dissimilar from those shared by Elizabeth Wardle's dedicated band of local women. Given that each panel of the replica was produced by a single hand, and it is evident from the workmanship that several people worked on each of the original panels, it is credible that the original could, practically, have been produced within one year. Whether it was, we do not know. The ladies of Leek omitted the human genitalia and the gender of the horses is much less prominent. These changes are subtle, with just a hint of undergarment to hide any naked flesh. The changes were presumably done by Elizabeth and the tracer. It is likely that the Leek ladies were familiar with the original, as a single set of engravings had been published. As a commercial venture, some self-censorship was undoubtedly wise, knowing the fuss that self-appointed guardians of our morals can make over trivia. Miss Ritchie, who undertook the panel including the scene with Aelfgyva, where the lower border has several naked bodies, has left some of the tracing visible rather than embroider lines that were not in the original. The hint of undergarments is pencilled in. But Miss Ritchie was evidently unhappy with this censorship. One must imagine that there were divided opinions and some heated debate with the prudes wining a narrow majority. For almost a decade the copy toured, including trips to America and Germany. But it was not a financial success. In June 1895 a former mayor of Reading, Arthur Hill, offered to buy the copy to present to the Borough. A vote saw the Society accept £300 for the replica and its travelling accessories. The Society’s records show that each needle worker received 2 pounds 5 shillings and 6 pence per yard of embroidery worked. In 1993, modern cleaning and conservation, sponsored by a local chemical company, returned the replica and it was installed in its own gallery in the Museum of Reading. It is an outstanding display and a visit is highly recommended. But just as the original should perhaps be called the Canterbury Tapestry, rather than associating it with Bayeux, so the Reading Replica should be associated with its origins in Leek!